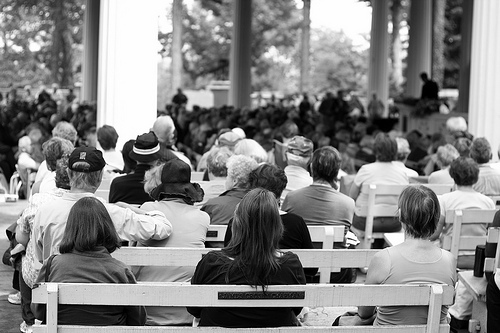 It predates TED talks by more than a century: The Chautauqua Institution, which every summer hosts 170,000 people for 2,000 events over a two-month period in the summer. For speakers, it's long been a mecca, featuring daily morning and afternoon lectures, as well as scores of plays, concerts, and more. Morning lectures take place in an amphitheatre that seats 5,000; afternoon lectures in the smaller, 700-seat Hall of Philosophy (shown here), where the spillover crowd can number 1,200 and the topic always focuses on religion, spirtuality or philosophy. And if you thought TED or Ignite! were the first talks to set speaker limits, you're way off base. Chautauqua speakers have strict speaking limits and must take audience questions. PBS has just launched a program every speaker should watch, Chautauqua: An American Narrative. The 2011 season of Chautauqua takes place June 25-August 28, and you can see this year's lineup of speakers at the link, as well as tools for building your visit calendar and more. There's much to explore, and the upstate New York setting and many outdoor venues are a big part of what makes this series of talks unusual. Have you been to Chautauqua?